UPDATE June 20th. I have realised I may have been too emotional about this. I have decided to try to learn more about what the Diplomacy 2.0 vision looks like in 2016, and then make up my mind. This post is a part of a series of reflections aimed at cutting back on the noughties’ hype about the wonderful changes of modern technology. The Internet is a wonderful thing, but, in retrospect, we seem to have gotten a little overenthusiastic. I am as guilty as anyone else, and am now trying to regain a more critical perspective (example). 2009, remember? A charismatic, charming, pre-drone strikes and let-Guantanamo-be Barack Obama sat in the White House, heralding a new era of Internet-powered transparency, accountability and collaboration. It was government 2.0’s finest hour. In 2009, a man named Alec Ross visited Italy on behalf of the State Department. He toured the country, and everywhere he went he asked to meet the local bloggers. The city authority in Bologna invited me to one such meeting. Wide-eyed with admiration at the cool of the Obama administration, a half dozen bloggers attended. Relaxed and confident, Ross looked and spoke more like a social media marketing early mover than like a diplomat. He also seemed to have no agenda: he just wanted State Department to be friends with the bloggers. That seemed very forward thinking. It still does. He called it “diplomacy 2.0”. Transparency and openness are in the interest of diplomats, he explained. The more clearly a country communicates, the better its positions can be understood, even more so in a media landscape where bloggers were becoming the main opinion makers. There will still be classified information, but the new normal was to be one of openness. Do you use psychiatrist and sociologist to measure: (i) Relative happiness as a means to gauge trustworthiness? (ii) Despondence and grumpiness as a means to gauge waning trustworthiness? But why reminesce about this now? Because I made a mistake: I endorsed the Diplomacy 2.0 concept. I tried to convince people I respect that yes, “diplomacy is the prosecution of war by other means” and all that, but you could trust these guys. They were like us. It made so much sense. Leading innovation expert Alec Ross explains what’s next for the world: the advances and stumbling blocks that will emerge in the next ten years, and how we can navigate them. The discussion that ensued was civilised, but unproductive and unpleasant. Ross insisted on blaming Senator Joe Lieberman, not the Obama administration, for the US reaction to the Cableleaks. Senator Lieberman has his sins to answer for, but this is, not to put too fine a point on it, a lie. The memorandum quoted above does not come from the U.S. Senate. It comes from a very senior officer in the executive branch. 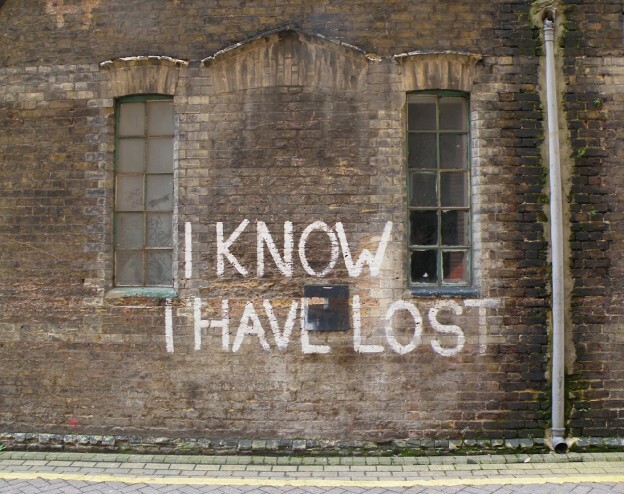 I backed off – we were getting nowhere, and I have no interest in trolling. I was in it for the learning. Still, I do not think Ross’s position (that everything is smooth sailing) is credible. I don’t think I will be reading this book. It’s not so much the wrong prediction, that happens to everyone, especially experts. It’s the refusal to acknowledge it that I cannot respect. Toeing the party line is just what you do not want in a futurist. Shame: Ross is smart and has been around, but I just cannot bring myself to trust him after this. Fool me once, shame on you. But fool me twice? 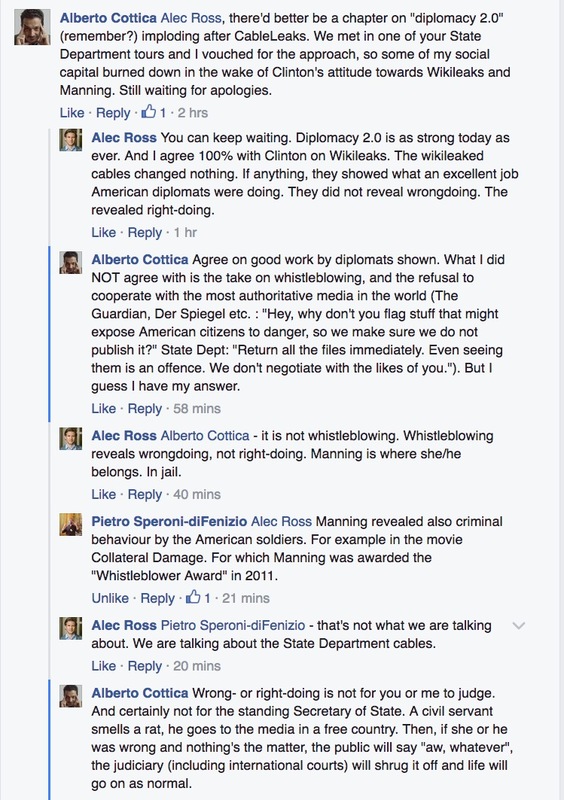 This entry was posted in digital life, Open government and tagged Alec Ross, diplomacy 2.0, Hillary Clinton, Wikileaks on 26 May 2016 by Alberto. More than five years after its setup (!) and more than seven after my first post on a now-forgotten Blogger blog (!! ), it was time to refresh Contrordine Compagni. The media landscape looks very different from the one I ventured in in 2005; in 2013 it is social networks, not blogs, that function as the default terrain for individual expression on the Internet. I, however, stand by my choice. This blog was a very successful investment. It now contains seven years of musings, and this helps me stay aware of my intellectual trajectory and not stray too far; what’s more, it helped many strangers to find me, and some of them are now precious colleagues and even friends. What’s more – and this is critical – I am the one who controls it: the database is my property, and I have the keys to the server. Should Facebook and Twitter decline in the future, just as MySpace did in the Noughties, my content will stay online and easy to find. The new Contrordine Compagni has three characteristics. A much cleaner and – for the first time – responsive theme (TwentyTwelve). Cleanliness is to highlight content over form; responsiveness is a friendly gesture towards the 20% of my readers that use mobile devices. A new hosting, Host Europe. Most importantly, a new way to manage multiple languages. Most of my posts are both in Italian and English. So far, I managed this with a plugin called Polyglot, which still works but is not maintained anymore. The new system is based on Polylang; it buys me a more usable back end, a cleaner database and a better control on RSS feeds, that are now completely separated. As a result, I now have an English-language-only feed. The solution was found and implemented by sterling-silver hacker Matthias Ansorg. The migration script from Polyglot to Polylang is documented here. Say hi to the new Contrordine Compagni. If you appreciated these last seven years-plus of blogging, use the Recommend box to give me a +1 or a Facebook like: you’ll help others to find it on search engines. And if you want to know what Contrordine Compagni means, it’s been there all the time. Ready for the next seven years? This entry was posted in digital life and tagged blogging, Polyglot, Polylang, RSS on 22 April 2013 by Alberto. For several years I have been an attentive reader of everything Clay Shirky I think he is a deep, original thinker, and I have learned much from him. His latest post is, as always, clear and bold. But, for the first time, it did not take me by surprise. Shirky – an academic by profession – takes on for the first time the disruption the Internet is bringing to higher eduation: he starts from the launch of Udacity and Coursera (“the education equivalent of Napster”) to explain how what he calls MOOCs (Massive Open Online Courses) are changing the landscape of academia, though the full blow has not connected yet. the risk is that we’ll be the last to know that the world has changed, because we can’t imagine—really cannot imagine—that story we tell ourselves about ourselves could start to fail. Even when it’s true. Especially when it’s true. 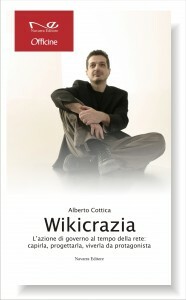 This entry was posted in digital life, Internet and tagged Clay Shirky, coursera, digital life, education, istruzione, Khan Academy, Udacity on 16 November 2012 by Alberto.